Cliff Dukes played collegiately for the Spartans of Michigan State starting 35 games and collecting 15.5 sacks over his time there. After hopping around the practice squads of the Rams (2005-2006) and Saints (2006), Cliff joined the Tampa Bay Storm of the Arena Football League in 2008 but notched only 1 tackle. 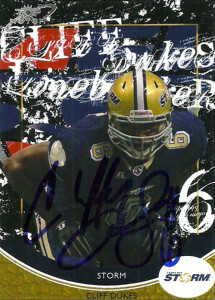 He’d head north and play for the Toronto Argos of the CFL in 2009. Returning to Tampa in 2010, Dukes unleashed havoc across the league and was named second team All-Arena after collecting 34.5 tackles and 7 sacks for the Storm. In 2011 Cliff led the league with 12.5 sacks. He’d be traded in 2012 to the Kansas City Command, but the Command would trade him just a few short days later to the Arizona Rattlers in a blockbuster trade. Since he joined the starting lineup of the Rattlers, Dukes has solidified the defensive front of the team and helped them win the past two Arena Bowls. Dukes was cool enough to sign his card for me and thanked me for the support. An imposing figure, Cliff’s recognizable afro seems almost out of character on his menacing frame.